BPAC Inc is pleased to be able to offer general practices a suite of clinical decision support modules, free-of-charge. These modules have been nationally funded for healthcare professionals in New Zealand through arrangements with the Ministry of Health, PHARMAC and Medsafe. These modules act as a both a decision support tool and process guide in each clinical area. Individualised options, questionnaires, standard treatment suggestions and appropriate referral documents are generated in a logical flow. Links to relevant websites for additional information and support are built in to each module. Downloadable patient information and/or links to suitable online patient advice are at your immediate call. The Nationally Funded modules are accessed via Best Practice decision support, which can be installed free-of-charge at any general practice in New Zealand. For the last two decades or more, New Zealand has had one of the highest rates per capita in the world of reporting adverse reactions to medicines. This high rate does not, however, reflect a more serious problem in New Zealand with adverse reactions to medicines; rather that we are more diligent about reporting these events. To help maintain this trend, this module enables the reporting of suspected adverse drug reactions directly to the National Centre for Adverse Reactions Monitoring (CARM). By “auto-filling” with information already held in the Patient Management System (PMS) the reporting of an adverse reaction is rapid and efficient. A copy of the report is automatically saved on the patients’ record. General Practitioners are now asked to notify cases of disease and injury caused by hazardous substances seen in primary care to their appropriate Medical Officer of Health. Notification may result in a Public Health Unit investigation of that particular event or a collection of related cases, or may initiate the investigation of a particular substance in a region or nationwide. This module guides the user quickly through the reporting process, supplies the information needed by the Ministry of Health and forwards the notification to the appropriate recipient. A copy of the report is then automatically saved to the patients’ record. New Zealand has one of the highest rates of childhood asthma in the developed world. Between 20 – 30% of the children in your practice are predicted to develop symptoms. Based on current guidelines, this module provides decision support for the diagnosis, control and treatment of childhood asthma using a stepwise approach. This in turn links into the Childhood Asthma Action Plan module. This module enables you to create an individualised action plan for a child with asthma (Space-to-Breath), illustrating which device they should use and when to use it. A black and white copy can be given to the family at the consultation and a high quality, colour version is automatically generated and posted to the patient’s address. The World Health Organisation estimates that by the year 2020, depression will be the second most common cause of ill health and premature death worldwide. The depression modules are divided into four key groups of patients: Young People, Adults, Elderly People and Ante/Postnatal depression. The patient’s demographic information is used to initiate the appropriate module, with relevant questionnaires and tools. These modules allow you to step through the appropriate questions as you talk with your patient, giving you more time to listen and engage. This is followed by the guidelines which suggest appropriate treatment and /or referrals. Patient resources, including further questionnaires, information and website links, are included in the modules. Every interaction with a young person in primary care should be regarded as an opportunity to assess their psychosocial as well as physical wellbeing. Young people may not be forthcoming with their problems and issues, but sensitive questioning can identify the need for further assessment. Adolescent depression is similar to depression in adults, with a greater likelihood of mood symptoms at presentation, but these may still be masked by behavioural problems, substance misuse or somatic symptoms. The assessment tools within this module will assist and support you as you work with these young patients. People are reluctant to discuss their depression symptoms for a number of reasons. It is estimated that two-thirds of people with depression who see a healthcare provider present with physical symptoms, such as headache, back problems or chronic pain. Use of this module during a routine consultation will help clarify and quantify a diagnosis of depression and subsequent management plan. Depression affects up to 10% of pregnant women and up to 15% of women in the postnatal period. This module focuses on the recognition, assessment and management of patients during this important time in their lives. Many older people are reluctant to “bother” their general practitioner about something other than a physical illness. They seldom mention depression and are more likely to talk about vague symptoms. Although they know they need help, some people have difficulty putting troubled feelings into words. Many older people may also perceive that a low mood is normal. Tools within this module, such as the Geriatric Depression Scale, have been specifically developed for older populations to help address these issues and to give more weight to mood related symptoms. There are approximately 46,000 people in New Zealand currently taking warfarin. This module utilises a validated formula to assist in ongoing management of a patient’s anticoagulant dosing. Included is a review page which prints back to your PMS, graphical display of INR level history, a calculator for average dose rate and a printable calendar for the patient’s use which clearly shows their daily dose regimen. Acne is one of the most common skin conditions, affecting up to 80% of people aged between 15 to 25 years. This module assists you in assessing the severity of acne, and directs you to the most appropriate resources and treatments options for your patient. If isotretinoin is an appropriate treatment, you can progress seamlessly to the isotretinoin module to initiate and manage this. This module can be used either as a stand-alone module or as part of the acne management module; progress through patient consent documents, laboratory request forms, results and writing of the prescription, with quick access to the Special Authority process. This module is designed to meet the PHARMAC recommendation that a support tool be utilised when prescribing isotretinoin. Both patient and prescriber information about the safe use of isotretinoin are included. The Ministry of Health has now funded two new Best Practice modules for national release – TIA/Stroke assessment and Chronic Kidney Disease. These modules will be rolled out to practices over the coming months. Further information will be provided in the next update. 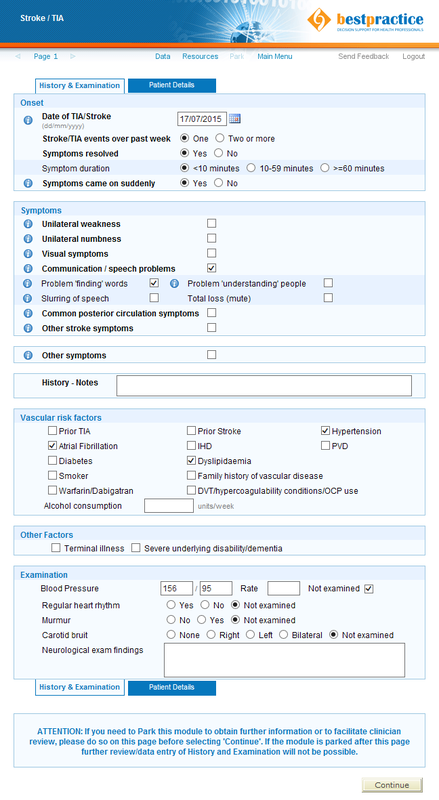 Above: The new TIA/Stroke electronic decision support data entry form showing a sample case. The product bestpractice Decision Support has been developed by BPAC Inc, which is separate from bpacnz. bpacnz bears no responsibility for bestpractice Decision Support or any use that is made of it.